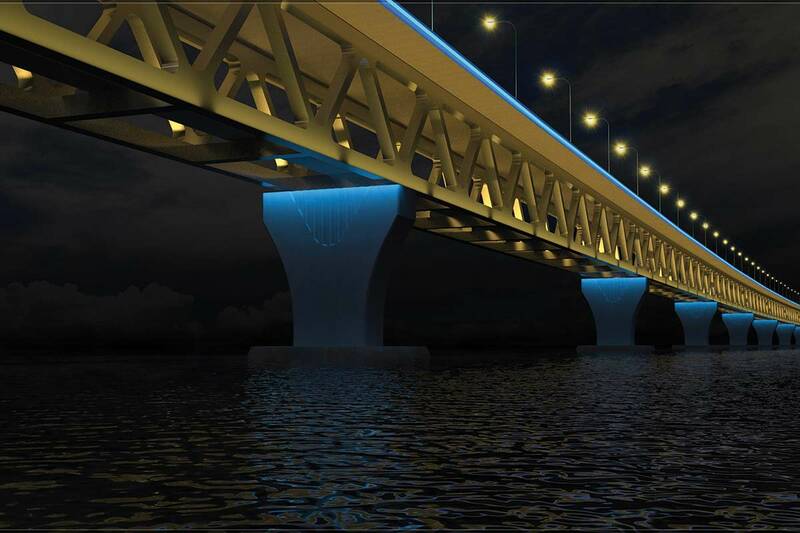 The Padma Bridge is a multipurpose road-rail bridge under construction across the Padma River in Bangladesh. The bridge will connect the south-west of the country to northern and eastern regions. It is the most challenging construction project in the history of Bangladesh. It will replace an existing, hazardous ferry link. The bridge will stimulate economic growth, increasing GDP by 1.2%, and also provide a reliable and relatively fast link to the poverty-stricken south west, increasing its GDP by 2.3%. An earthquake can strike a piled foundation at its most vulnerable, when the piles have lost substantial embedment through deep riverbed scour. The Padma Bridge design pursued the 'displacement based approach' for seismic resilience and implemented seismic isolation between the superstructure girder and the pier-and-foundation system. This approach enables the principal bridge components to move relative to one another under earthquakes; thereby dissipating the large forces. Friction pendulum bearings are used to permit large relative displacements between the bridge superstructure and the bridge piers. The two-level steeltruss bridgewill carry a four-lane highway on the upper level and a single track freight railway on a lower level. At 6.15km (3.8 miles) in length, the Padma Bridge will be a landmark structure and one of the longest river crossings in the world. The Padma River is the third largest river in the world, and has the largest volume of sediment transport. During monsoon seasons, the Padma River becomes fast flowing and is susceptible to deep scour, requiring deep-pile foundations for bridge stability. The site is also in an area of considerable seismic activity, resulting in significant earthquake forces being exerted on the bridge. This combination posed a unique challenge for the design team of international and national consultants led by AECOM. The team comprises AECOM, SMEC International, Northwest Hydraulic Consultants and ACE Consultants, with additional assistance from Aas-Jakobsenand HR Wallingford.